This book examines the development of cinematic form and culture in Russia, from its late nineteenth-century beginnings as a fairground attraction to the early post-Revolutionary years. The author traces the changing perceptions of cinema and its social transition from a modernist invention to a national art form. He explores reactions to the earliest films from actors, novelists, poets, writers and journalists. His richly detailed study of the physical elements of cinematic performance includes the architecture and illumination of the cinema foyer, the speed of projection and film acoustics. In contrast to standard film histories, this book focuses on reflected images: rather than discussing films and film-makers, it features the historical film-goer and early writings on film. 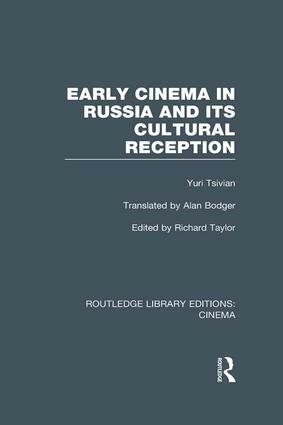 The book presents a vivid and changing picture of cinema culture in Russia in the twilight of the tsarist era and the first decades of the twentieth century. The study expands the whole context of reception studies and opens up questions about reception relevant to other national cinemas.